Bottom of barrel teams this week. We have the Giants that are 0-6 and the Vikings that have only won one game so far! My pick is the Giants.. They have to win sometime right?! Also during the week I become an ambassador for the St. Michaels Running Festival! I am very excited about this race in the spring and hope to get lots of people to join me in the race!! Check out http://www.runstm.com for more details! If you already know that you want to run one of the three races (half, 10k or 5k) sign up now and use the code AMBKRISTENJO to save 10%!! Only 93 more miles till I reach my goal of 500 for the year! For many that may not seem like that many miles to log in one year but I like to remember that I was pregnant 6 of the 10 months we have had so far this year. I ended up running one morning before work and one afternoon after work but finding the energy has been hard. After a long day at school I am spent- and can’t wait to see my babies. I am living by the motto – do what you can, when you can. I try not to be mad at myself for not working out, but instead proud of myself for whatever I do get to do- whether it be a spin class, neighborhood walk or treadmill run. Do you have any tips or tricks to keeping your fitness consistent? Having my dinners pre made really helps but I’m always looking for more ways to simplify. I’m hoping to log a few miles during football today while cheering on my Ravens!! Excited to see everyone’s picks for the week. 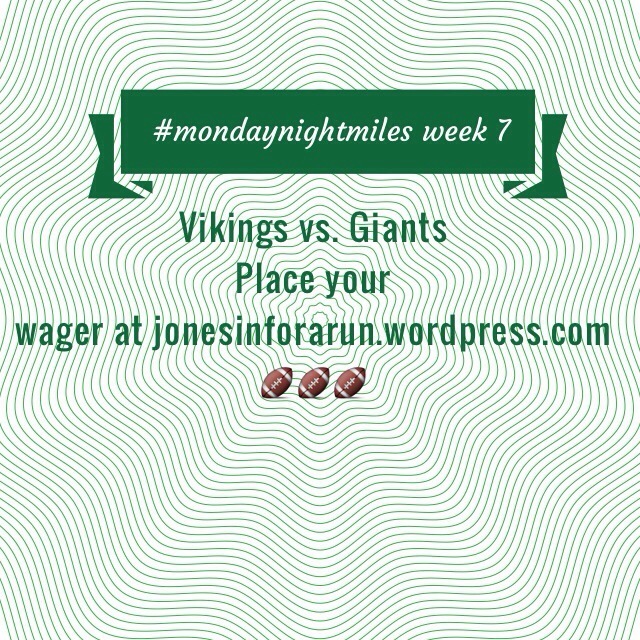 Bring on Monday night football and lots of #mindaynightmiles!!! Who are you picking?! Vikings! And you are awesome! Way to go with your miles!